*Cannot be combined with health or vision insurance. Sign-up using the form or call us at 210-988-9517 to take advantage of this exclusive offer. Call us at 210-988-9518 today. 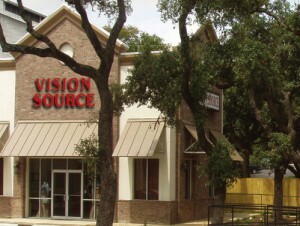 Welcome to Vision Source Castle Hills. If you have delayed getting an eye exam but know you need one, you are not alone. Many eye disorders are asymptomatic or progress so gradually that they can remain undetected for years. A majority of San Antonio residents have not had an eye exam in years. As a full lab, full optical, Dr. owned and operated eye care center, your San Antonio Optometrist, Dr. Raul Trevino, and the team at Vision Source are have been serving San Antonio residents for over a decade and are committed to providing you with superior vision care. In addition to testing your eyesight, Dr. Trevino uses advanced examination procedures for detecting eye diseases that interfere with proper blood flow to the eyes, raise blood pressure in the eyes and impair functioning of eye muscles designed to control eye movement. Although most age-related eye disorders may not be preventable, having an annual eye exam may help delay their emergence and minimize severity of the disorder. Our San Antonio eye center offers glaucoma testing, eye function testing and LASIK surgery for people who no longer want to wear corrective lenses. We also treat eye emergencies, such as foreign objects in the eye, trauma to the eye or work-related eye emergencies. We consider you and your family as part of our family at Vision Source Castle Hills. During your visit, your eye doctor will explain tests and procedures you may be unfamiliar with and answer any questions you have about your eye examination. We consistently strive to make our patients feel as comfortable as possible during their visit. "Dr.Trevino and his staff are very friendly, helpful and professional." "great staff fast service doctor's always willing to explain any procedures or methods that they're doing and why and how it helps them in simple terms for almost anyone to understand"